Picture it in Dad's hammock, in a chair on the deck, on a porch swing. 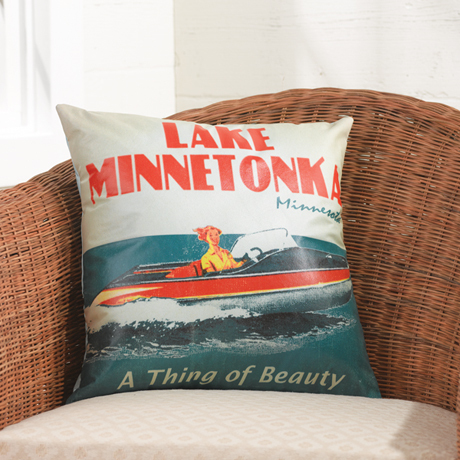 Printed with vintage postcard art, it's personalized with any place name you choose: a lake, a town, your favorite getaway. Water-resistant, wipe-clean vinyl cover reverses to solid sky blue. Velcro closure, polyfill insert. 17" square. Specify place name (up to 15 characters) and state. Allow 4 weeks for delivery. No rush delivery or gift box. Made in USA. Item can only be shipped within the Continental US.